‘Profile of Self’, by James Montgomery (held at Sheffield Archives). Though my work on politics and politeness in the Whig-sponsored press of the early Hanoverian period continues, I am now also researching the political writing of Sheffield’s own James Montgomery (1771-1854). I will be charting the progress of my work on this blog. Here you can see what I’m up too, find out about upcoming Montgomery events, or get in touch if you have any questions! Academic Talk: Secular and Spiritual Synergies in the writing of James Montgomery, the radical poet behind ‘Angels from the Realms of Glory’, The School of Humanities, Religion and Philosophy, York St John University. 14 February 2018. 4.15pm-5.45pm. 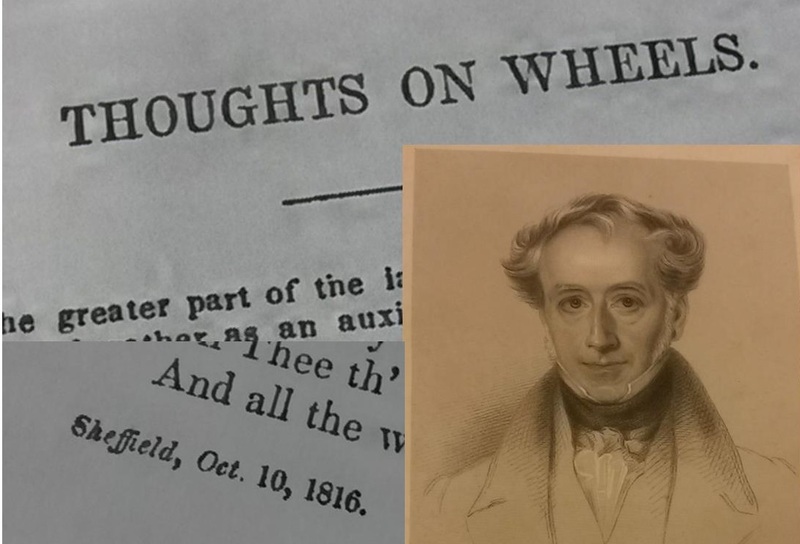 Public Event: ‘”Regard our Prayers, our Cause be be Thine”: Politicising the Verse of Sheffield Hymn-Writer, James Montgomery’, Sheffield Institute for Interdisciplinary Biblical Studies, 11 December 2017, 2-4pm. Public Event ‘Poetry, Protest and Imprisonment: James Montgomery in York Castle Prison’, Mint Yard Lecture, York Explore Library, 11 April 2017, 6-8pm. 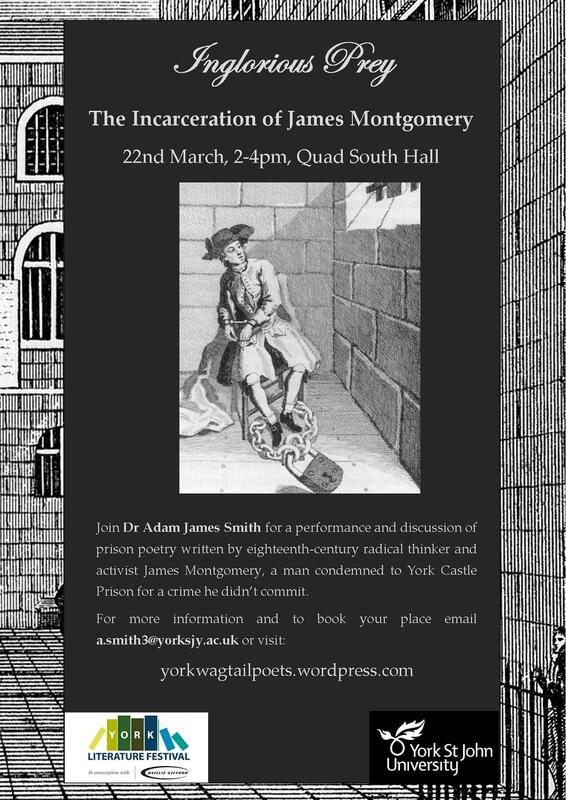 Public Event: ‘Inglorious Prey: The Incarceration of James Montgomery’, York Literature Festival, York St John University, Quad South Hall, 22 March 2017, 2-4pm. Public Event: ‘Poetry and Protest’, Off The Shelf Festival, Sheffield Students Union, 17 October 2016, 7.30pm. Public Event: ‘James Montgomery: A Life of Activism’, a Dramatic Production by Eclipse Theatre Group, 25 September 2016, 12pm and 3pm, Barker’s Pool, Sheffield. Public Event: ‘The Montgomery Theatre Heritage Open Day’, 10 September, Sheffield. 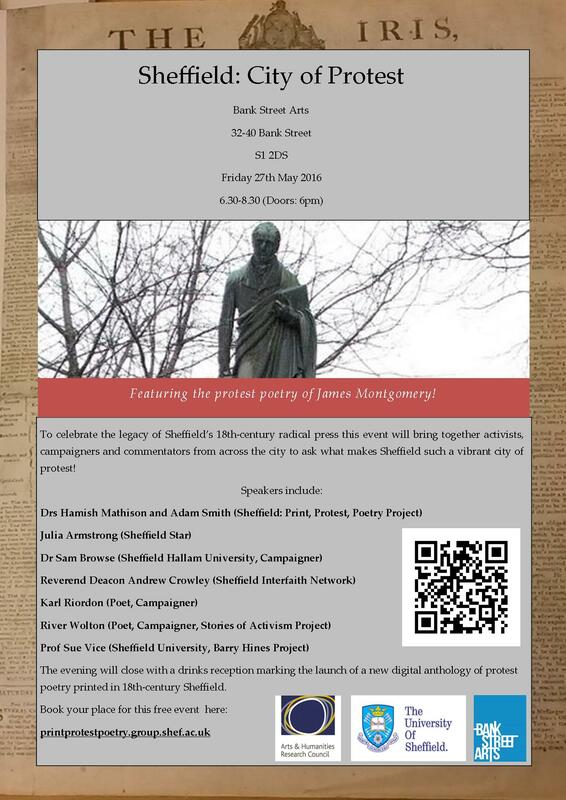 Public Event: ‘Sheffield: City of Protest’, 27 May, Bank Street Arts, Sheffield. 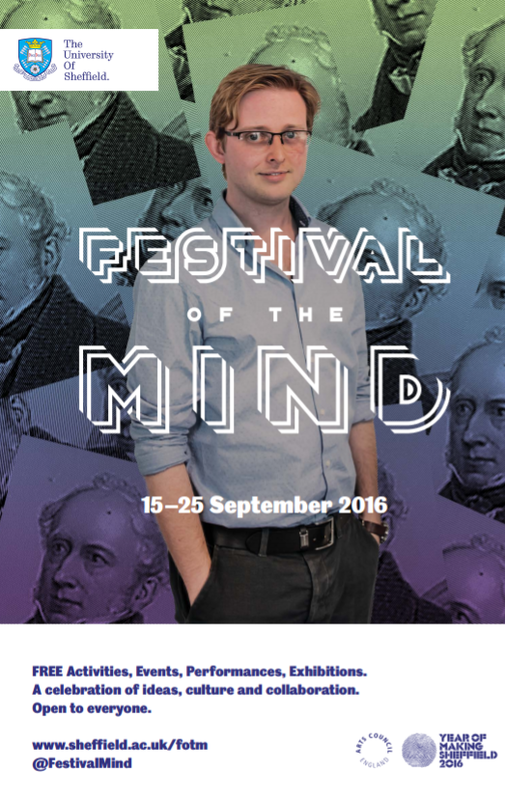 Academic Talk: ‘”The Price of Tickets and of Souls”: James Montgomery’s Political Poetry of 1816’, June 2016, ‘Summer of 1816: Creativity and Turmoil’, University of Sheffield. Listen to the podcast! Academic Talk: ‘Literary Criticism in the Trial of James Montgomery and Sheffield’s Radical Press’, 7th January 2016, St Hugh’s College, Oxford University. This paper forms part of a panel titled ‘Printing, Publishing and Reading Communities in 18th-Century Yorkshire’ at the British Society for Eighteenth-Century Studies Annual Conference. 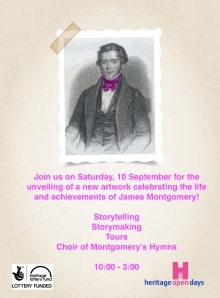 Public Talk: ‘Poetry on Trial: The Prosecution of James Montgomery’, Mobile University, Sheffield City Centre, 14th September 2015. Public Event: ‘Printing in 18th-Century York’, York Festival of Ideas, 16 June 2015. This AHRC-funded cultural engagement saw Dr Hamish Mathison and I creating an on-going digital anthology of protest poetry printed in Sheffield’s radical press at the end of turn of the 19th century. Find out more about James Montgomery! Portrait and signature of James Montgomery reproduced in Rev. Odom’s biography. Drop into Sheffield Archives on Shoreham Street and consult the catalogue to read letters, essays and notes written by Montgomery himself!